We travelled north towards the Lake of Bolsena, the largest volcanic lake in Europe and the town where the miracle of Corpus Christi took place in 1263. Bolsena is on the Roman Via Cassia, often called Via Francigena (the road of the Franks) or Via Romea, the route for the pilgrims from the north on their way to Rome. A priest from Prague stopped to celebrate mass in the small wayside church of Saint Christina, an early Christian martyr. As he celebrated, he began to doubt the miracle of the Eucharist, and blood began flowing from the host on to the altar cloth. 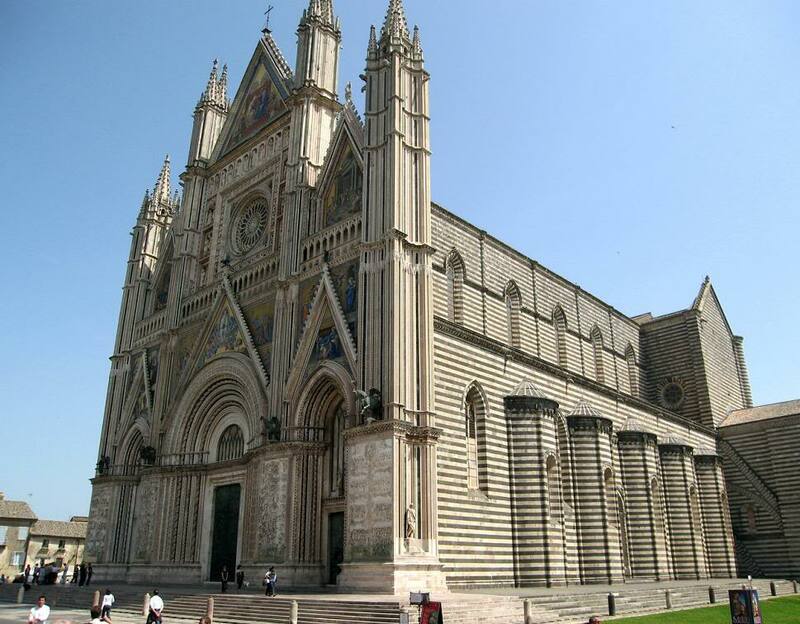 He rushed to the Pope who happened to be in nearby Orvieto, and Urban IV instituted the Feast of Corpus Christi, celebrated on the first Sunday in June after the Feast of the Trinity. 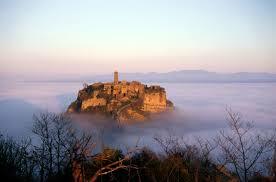 particularly at Civita di Bagnoregio. In the early Middle Ages it developed under the Lombards into a town with two boroughs. 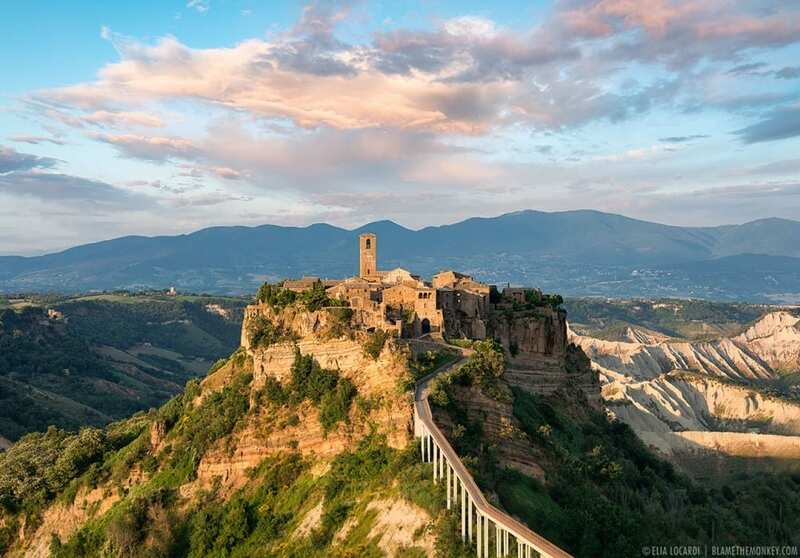 After the 1695 earthquake, the borough of Civita was damaged and the bishop’s seat transferred to Rota, now Bagnoregio. The 1764 earthquake separated the two boroughs and caused the connecting road to collapse. The two boroughs were now divided by a chasm and Bagnoregio was abandoned until the modern bridge was built in 1965. The scenery is dramatic. We reached Bagnoregio after a walk over the bridge suspended above cavernous cliffs. When I first visited it many years ago it was only inhabited by artists who found inexpensive places to live. Now much of it is restored and the church is a place of pilgrimage. St. Bonaventure was born in Rota in 1221, five years before St. Francis died, and studied in Lyons where an Englishman, Alexander of Hales, persuaded him to become a Franciscan monk. He became a great theologian, like his contemporary St. Thomas Aquinas, a Dominican, and together they defended their two recently founded mendicant orders. St. Bonaventure wrote a biography of St. Francis while St. Thomas Aquinas was asked to write a mass to celebrate the Feast of Corpus Christi. An interesting detail is that in 1265 Bonaventure declined the Archbishopric of York. The repopulated borough feels like a special place, one of pilgrimage. Just imagine what the two devastating earthquakes must have meant to the inhabitants of the two boroughs! destroyed by frequent incursions along the Via Cassia and from the late 5th century a town was re-established where the original Volsinii was and renamed Urbs Vetus, old city, or Orvieto. I wonder how much of the previous Etruscan and Roman city remained. It became a vital city state ruling over the vast territory once controlled by the Etruscans until the mid-14th century, when it became part of the Papal States. commission to enhance the Vatican. Years passed. Then Perugino was commissioned to continue the vault, but he was too busy in the Sistine Chapel. Finally, towards the end of the 15th century, Signorelli from Cortona was called in to complete Fra Angelico’s vault frescoes – one could hardly imagine two such different styles! 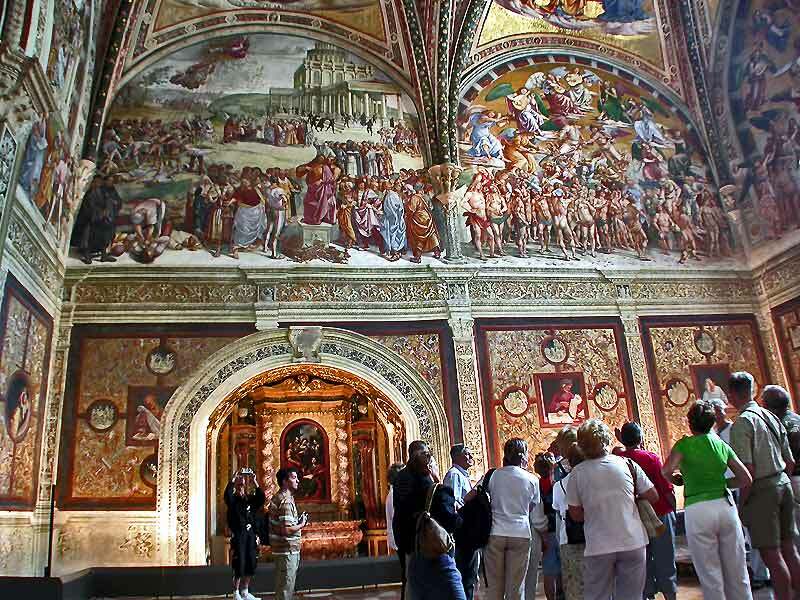 He so impressed the cathedral authorities that he was asked to fresco the chapel walls, in the process producing what most consider to be his masterpiece. Michelangelo is on record as having admired its dramatic muscular strength. Signorelli’s fresco of The Last Judgement may have influenced Michelangelo’s on the end wall of the Sistine Chapel..
On our return journey we stopped at a country house set in its own vineyards and, after an idiosyncratic and highly amusing introduction by the owner, she took us on a tour of the cellars. Our visit ended with a wine tasting with cheese and lightly toasted bread and a lively introduction to each of the white and red wines. Not having serious luggage restrictions on our return flight, many gave into temptation and bought bottles of mine. I asked the feisty proprietor to sign mine – she had never been asked this before!